Britain Stronger in Europe (formally The in Campaign Ltd.) was an advocacy group which unsuccessfully campaigned in favour of the United Kingdom continuing membership of the European Union in the 2016 British referendum. It was launched at the Truman Brewery in London on 12 October 2015 and declared as the official "Remain" campaign for the referendum by the Electoral Commission on 13 April 2016. In the United Kingdom European Union membership referendum, 2016, 51.9% voted in favour of leaving the EU, which meant that the Britain Stronger in Europe campaign was unsuccessful in achieving its main goal. Following the referendum, many of the individuals involved such as Peter Mandelson and Roland Rudd would go on to form the Open Britain campaign group. The in Campaign is registered as a private limited company, registration number 09641190. Will Straw is the executive director of the group. 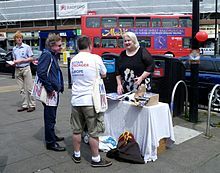 Several groups campaigned for Britain to remain in the EU during the referendum. These include: the campaign group British Influence, the individual membership organisation the European Movement, as well as separate political parties who each had their own campaign (e.g. Labour In for Britain and Conservatives In), various special interest groups (e.g. Environmentalists for Europe), regional groups (e.g. Cambridge for Europe) and professional groups (e.g. Scientists for EU) and Brand EU. ^ "EU referendum: Lord Rose says it is 'patriotic' to remain in the EU". BBC. 12 October 2015. Retrieved 12 October 2015. ^ a b Wright, Oliver (11 October 2015). "EU referendum: Britain will become a 'third-rate' power if it severs ties with Europe, warns Kenneth Clarke". The Independent. Retrieved 12 October 2015. ^ a b Noble, Josh (12 October 2015). "Britain Stronger in Europe: The key figures in pro-EU campaign". Financial Times. ISSN 0307-1766. Retrieved 12 October 2015. ^ "Lead EU referendum campaigns named". BBC News. 13 April 2016. Retrieved 14 April 2016. ^ Slack, James (19 October 2016). "New bid to halt Brexit - by the same old faces: Mandelson, Straw's son and brother of Home Secretary who led pro-EU 'Stronger In' group are back - as 'Open Britain'". Retrieved 7 November 2016. ^ King, Esther (22 December 2015). "Britain Stronger in Europe: A grassroots army gets to work – POLITICO". Politico.eu. Retrieved 9 November 2016. ^ "Pro-EU Communities". Scientists for EU. Retrieved 14 March 2016. Wikimedia Commons has media related to Britain Stronger in Europe.